Neva Lee Recla is on a mission to inspire 1 million kids to start businesses. In February 2012, Neva Lee Recla got her first business cards…at age 2. She attended CEO Space International Business Conference 312 and never looked back. Through many different business ventures, she’s well-versed in entrepreneurship. One of her career highlights was meeting Bob Proctor and doing a video about his Stick Person Theory. As the host of the Super Power KidsTM podcast, Neva shares her techniques of hugging her gremlins, moving energy, healing with sound through mermaid singing, crystal reiki and embracing the power to be who you are. Her goal is to inspire all kids and adults to be themselves. She believes all kids have super powers and they can change the world. Neva Lee Recla is on a mission to inspire 1 million kids to start businesses. 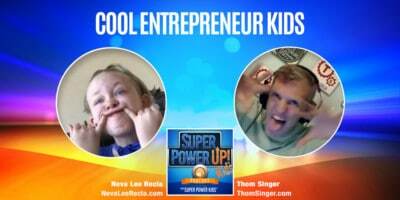 Get the tools to inspire your young entrepreneur so they can go out and change the world. This book gives you the insights you need to support your child on their entrepreneurial journey. Order your copies today! In 2018, Neva Lee Recla attended her second Burning Man with her family. While there she gave oracle readings as her gift to her fellow Burners. During the week she delivered over 80 readings to those in attendance and Kid KlarityTM was born! Get your three card, intuitive reading from Neva Lee Recla. Readings are done via Zoom video. Neva Lee Recla | DECA WRLC 2017 Keynote from White Tie Productions on Vimeo. Neva is no stranger to all things personal growth and woo-woo. She lives the processes and practices promoted by Super Power Experts and makes them her own to inspire other kids, parents, entrepreneurs and adults.